Menstrual cramps, sometimes also referred to as 'Dysmenorrhea' or 'period pains' can cause serious discomfort and be hugely disruptive to women. These monthly bouts of pain mixed with hormonal changes can often leave sufferers in a volatile state. About half of women experience menstrual cramps with about 15% describing the pain as severe. It has been shown that women who do not exercise experience more painful attacks. Primary Dysmenorrhea - This is by far the most common form of menstrual cramp. Symptoms include pain in the lower abdomen and back. It is common to feel the pain 1-2 days before the period begins and a day or so following. Secondary Dysmenorrhea? - This is the name given to monthly cramps that are a result of other underlying medical issues including; fibroids, endometriosis and pelvic inflammatory disease. Ever craved chocolate before your period? This is because your body is clamouring for the Magnesium found in dark chocolate. The nutrients Calcium and Magnesium are essential for muscle function and are known to be very effective in reducing menstrual cramps. A lack of Magnesium can cause cramps to be stronger and more frequent than normal. While Magnesium will help to reduce the pain, it probably won't remove the cramps completely. This is because cramping during your period is actually a normal process needed to remove blood. During the period itself, taking about 250 mg of calcium and 100 mg of Magnesium citrate every four hours can often help to relieve symptoms. This can be increased up to 1,200mg over time. Used in combination with conventional painkillers this combination will have you feeling well enough to get on with your day in no time. Other natural remedies for period pains? Cramp Bark - When the symptoms are at their worst, it might also help to use a preparation of the herb Cramp Bark (Viburnum Opulus). This probably won't surprise you, given its name, but cramp bark is exceptional at relieving muscle cramps. This can be found and most health food shops. Acupuncture - Acupuncture has become a popular treatment for menstrual pain. The National Institutes of Health recommend acupuncture either by itself or in conjunction with other treatments for menstrual pain. In a well-designed study of 43 women with menstrual pain, women treated with acupuncture had less pain and needed less medication. Vitamin D - Around 400 IU of vitamin D daily helps your body to better absorb calcium as well as reducing inflammation. However, vitamin D is known to react with some medications when taken in supplement form. 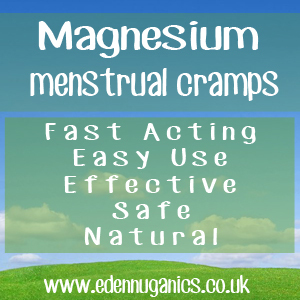 Has Magnesium helped your menstrual cramps?